I am implementing an . 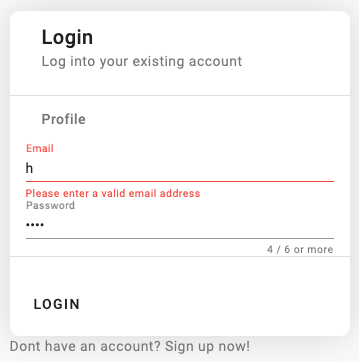 user interface for the firebase login. For that i am using angular material. For easier input correction on the user side i want to implement mat-hints for the user to show an error whenever the user typed something that was not expected. 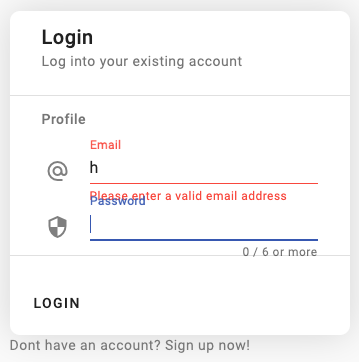 <input matInput placeholder="Email" [(ngModel)]="email" [formControl]="emailFormControl"
However it seems that the mat-form-field with mat-hints and placeholders is not designed to work within an mat-list-item, because the result looks like this. if i remove the mat-list-item (and the little icon in front of the mat-form-field) then the hints and placeholders are not overlapping. As you can see, the result is not pretty as well because the subheader is misaligned with the form field. Additionally, i think that the first option (with the overlapping) looks better because of the little icons. I&apos;m wondering what my options are in this situation because i don&apos;t want to break the material design by adding additional margins or paddings. However, i guess that this is intended behaviour and that i am doing something wrong. How can i design this user interface in a way that the input fields with hints and placeholders are not overlapping? A better way to do it would be to provide styling with higher specificity (i.e. add an extra class to each list-item with your styling). The alternative is to add padding to the left of mat-form-field to match the padding of the header. Not the answer you&apos;re looking for? Browse other questions tagged angular angular-material or ask your own question. How to add “floating label” for md-datepicker in angular material design?